Nearly 160 years ago, the Royal Hospital for Neuro-disability (RHN) emerged from the Victorian era of Charles Dickens and Florence Nightingale. Now visitors can share in the charity’s rich and fascinating history in the very first free Heritage Open Day on Tuesday 19 February. Perfect for anyone with an interest in social history, this special event will showcase unique items from the Hospital’s archive for the first time, and will give visitors the chance to go behind the scenes with free guided tours. Visitors will also be invited to share their stories and memories of the RHN in a bid to preserve oral histories of the charity for generations to come. In the mid-nineteenth century, individuals with diseases which were at that time considered incurable, were by no means welcomed into or retained in general hospitals. One of the great 19th-century philanthropists, Dr Andrew Reed, recognised this and so founded the RHN (then called the Royal Hospital for Incurables) in 1854. Two prominent figures, who were instrumental in setting up the charity, were Charles Dickens and Florence Nightingale. 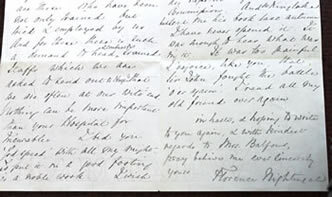 Texts of an 1857 speech by Dickens will be on display, as well as letters written to the Hospital from Nightingale, after Andrew Reed sought her advice on planning the Hospital’s move to its present site in Putney, London. Original fundraising appeals from 1912, fundraising adverts from the 1930s and photographs of patients and staff from as early as 1901 will transport visitors back in time. This is the first event at the RHN to display these unique items, which give a glimpse into the medical, social and local history of the RHN. The event will give visitors the opportunity to discover the Victorian listed building with guided tours around many of the Hospital’s beautiful rooms. The RHN has always been a big part of the local community. As such, the Hospital would like to collect oral histories on the day, from anyone with a story to tell about the RHN. Whether that be from someone who has worked at the Hospital, has volunteered or has a personal connection to the charity, all stories and memories are invaluable in preserving an oral record for future generations. Visitors can choose to write down their stories, or alternatively they can be filmed; recordings of which will be displayed in a forthcoming exhibition at Wandsworth Museum in 2014. The Heritage Open Day gives people the chance to discover what lies behind the Hospital’s striking exterior, and how far the Hospital has come in 160 years.